When you're not really into sports that involve handling different types of balls, how can you engage your guy in a competitive activity? Swimming is one way. Not only can you swim together and race each other for fun, you can also watch competitions together. After giving you a crash course in basketball and volleyball, we give you our primer on swimming, to better arm you when having a sports convo with your guy. Whether or not your dude's a swimmer (like the first of our July Cosmo Online Hunks, Mike Advincula, a swoon-worthy member and former captain of De La Salle University's swim team), you can now keep afloat in a conversation when watching a swimming competition, be it on the UAAP or the Olympics (next year). The object of the competition is always the same: to complete the course with the fastest time. Points. Scoring is based on the individual finishes of a swimmer. In the UAAP, there are different competitions: 800-meter freestyle, 200-meter individual medley, 100-meter butterfly, 50-meter butterfly, 400-meter individual medley, 1,500-meter freestyle, and 200-meter butterfly. Every individual finish corresponds to one point. At the end of the tournament, scores are added to determine the winning school. The UAAP has six of eight teams competing in both the men's and women's swimming tournaments. The NCAA has teams competing in the men's division, but the women's division is still an exhibition. "Freestyle" – A common stroke with no definite method. It most commonly refers to the "front crawl," when a swimmer who's facing the bottom of the pool moves by fluttering his feet while his hands move in alternate strokes. "Backstroke" – A swimmer looks like he's lying on his back, and moves by fluttering his feet while the arms do alternate strokes. 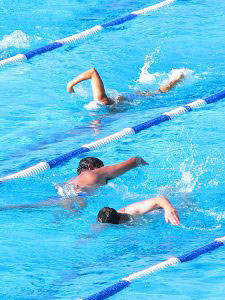 "Breast stroke" – The swimmer's feet are kicking in a splitting motion (like a frog's legs!) while moving his arms from a point in front of the head to the shoulder level. "Butterfly" – It's the most complicated and exhausting stroke, but arguably the fastest. Both feet are kept together and kick at the same time, while both arms move in a windmill-like fashion. "Individual medley" – The swimmer does four strokes over equal distances. He finishes the required distance for one stroke, and then shifts to another. The usual order is: butterfly, backstroke, breaststroke, and freestyle. Michael Phelps. He's been voted World Swimmer of the Year four times and is often called "the greatest current swimmer of all time." He has set world records and is the youngest male to ever have set a swimming record. Eric Buhain. The current chairman of the Philippines' Games and Amusement Board, he gained popularity as a champion swimmer. He began swimming because his doctor said it would improve his lungs. Enchong Dee. He's a hot young actor and Cosmo Centerfold, known for being an accomplished swimmer for De La Salle University. University of the Philippines. Their swimmers have been a constant force to reckon with in the UAAP. They are the defending champions in both the men's and women's competitions. University of Santo Tomas. They're a historically good swim team and have the most championships in both divisions in UAAP history. Make sure you check out our primer on the sport that the Azkals made popular in the country, football, out tomorrow!